PESHAWAR: Pakistan yesterday hanged four men linked to the Taleban’s massacre of more than 130 schoolchildren, with parents of victims saying they deserved “no forgiveness” as the attack anniversary approached. The executions, which officials said were carried out yesterday morning at a prison in the northwestern city of Kohat, were the first in connection with the Dec 16 attack on an army-run school in the northwestern city of Peshawar. The army has put the final toll at 151 killed, 134 of them children. Survivors of the assault said they were happy to hear of the executions. But fathers of the victims who gathered in Peshawar yesterday said the hangings should have been carried out in public squares. “All the nation wanted to see these animals hanged publicly so others would not dare follow their example,” said Abid Raza Bangash, an engineer whose 15-year-old son Rafique Raza Bangash was killed. A Kohat police official named the militants as Maulvi Abdus Salam, Hazrat Ali, Mujeebur Rehman and Sabeel, alias Yahya. The army on Monday issued a so-called black warrant confirming their executions were imminent. Their role in the massacre has not been made public. The gunmen were all reported killed by security forces. Some 20 fathers gathered for an emotional meeting in Peshawar yesterday, with several in tears and many angrily echoing the call for the gunmen to have been hanged in public. Parents of the Peshawar victims meet regularly, and yesterday’s gathering had been scheduled before news of the hangings broke. The fathers were seeking to present demands to the government that their children be awarded Pakistan’s highest civilian honor, the Nishan-e-Pakistan. Other parents told AFP the executions would deter future attacks. “The parents of the schoolchildren have long been demanding that the terrorists be severely punished, and today we are satisfied our demands have been met,” said Ajoon Khan, who lost his only son. 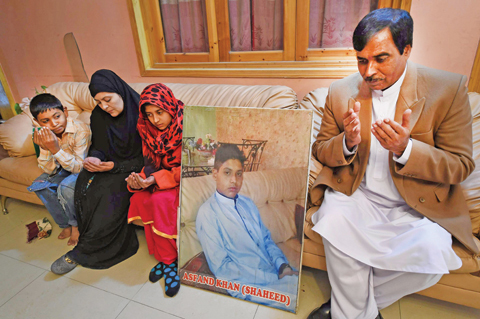 “The hangings won’t bring back my son, but now other people’s sons will be kept safer,” said Tufail Ahmed Khan, who lost one son while another was wounded. The attack prompted a nationwide crackdown on extremism, with the establishment of military courts and the resumption of capital punishment after a six-year moratorium. In August, after a military trial that took place behind closed doors, the army announced that six militants linked to the Peshawar assault would be executed, while a seventh was given a life sentence. The four executed yesterday were the first to be hanged after those convictions. The International Commission of Jurists has condemned the military courts as “secret, opaque” and in violation of fair trial obligations.